A Sufi is a member of the mystical, ascetic branch of Islam. Asceticism means abstaining from worldly pleasures, living frugally, and concentrating all of your energy on spiritual development. Sufism emphasizes personal experience with the divine rather than focusing on the teachings of human religious scholars. Sufis may also be members of either the Sunni or Shi'a division of Islam, although the vast majority are Sunnis. Alternate names for the Sufis include the non-politically correct dervish or whirling dervish, and tasawwuf. The word "sufi" likely comes from the Arabic suf meaning wool, in reference to the traditional rough woolen cloaks that ascetic Sufis wore. Tasawwuf also comes from the same root ("sawwuf" is a variant of "suf"). 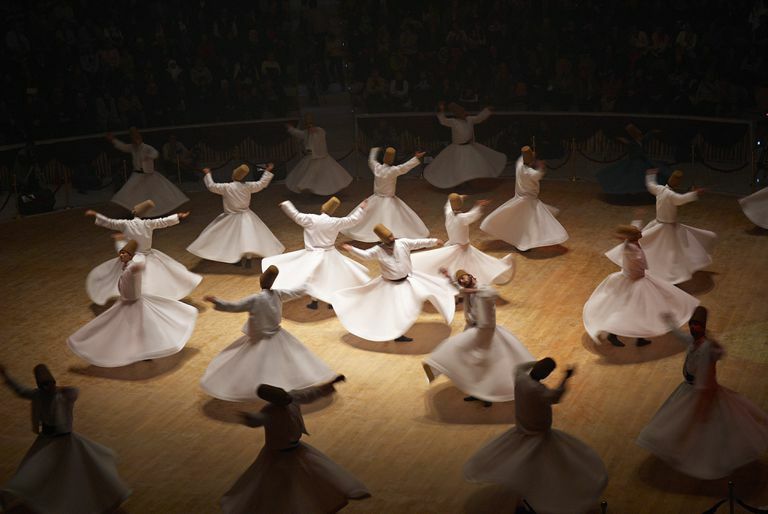 In some Sufi orders, practices such as chanting or spinning in circles help Sufi practitioners achieve a natural trance state in order to experience oneness with God. This is the origin of the English phrase "whirling dervish." Traditional Sufis were known for their practice of repeating the many names of God after their prayers, a ritual known as dhikr. Such Sufi practices are viewed as un-Islamic or heretical by some of the strictest constructionists from other Muslim sects, who disapprove of song and dance as distractions from worship. As such, the Sufis have long been considered among the more "liberal" of Islamic orders. As with other religions such as Buddhism, the ultimate goal of Sufism is to extinguish the self. It is a complete interiorization of Islamic practice and an intensification of the Islamic faith. The goal is to approach Allah during this lifetime, rather than having to wait until after death to become close to Him. Sufism may have developed as a reaction against the materialism of some Islamic practice. After all, the Prophet himself was a wealthy merchant, and unlike Christianity's condemnation of the wealthy, Islam is generally supportive of trade and commerce. However, Muslims of a more spiritual bent likely developed Sufi practices during the early Umayyad Caliphate (661 - 750 CE) as an alternative to the worldly version of Islam being practiced at court. "On the seeker's path, wise men and fools are one./ In His love, brothers and strangers are one./ Go on! Drink the wine of the Beloved!/ In that faith, Muslims and pagans are one." Sufi teachings and poetry had a profound political influence on Muslim world leaders, as well. One example is Akbar the Great of Mughal India, who was a Sufi devotee. He practiced a very expansive version of Islam, which allowed him to make peace with the Hindu majority in his empire, and build a new and inclusive culture there that was a jewel of the early modern world.